Hawaii in path of tsunami after 7.7 earthquake strikes western Canada. Sirens blaring across parts of Hawaii urged residents to seek higher ground as a tsunami, triggered by a sizable 7.7-magnitude earthquake in western Canada, headed toward them. Waves between 3 and 7 feet are expected to lash the islands, beginning about 10:28 p.m. local time Saturday (3:28 a.m. Sunday ET), the Pacific Tsunami Warning Center said. "Basically this tsunami is pointed right at us," said Gerard Fryer, senior geophysicist at center. The impact could last for hours. "It's not just one wave, it's a succession of waves," Fryer said. "We are recommending coastal evacuation." But he noted that the tsunami will not be as significant as the devastating quake and tsunami that killed thousands in Japan in March 2011. The tsunami was spawned by an earthquake in western British Columbia, prompting a local tsunami warning and sending some residents toward higher ground. " A (magnitude) 7.7 is a big, hefty earthquake -- not something you can ignore," Fryer said. "It definitely would have done some damage if it had been under a city." Instead, the quake struck about 139 kilometers (86 miles) south of Masset, on British Columbia's Queen Charlotte Islands. No major damage was reported. The Alaska Tsunami Warning Center issued a warning for western British Columbia from Vancouver to the southern panhandle of Alaska. 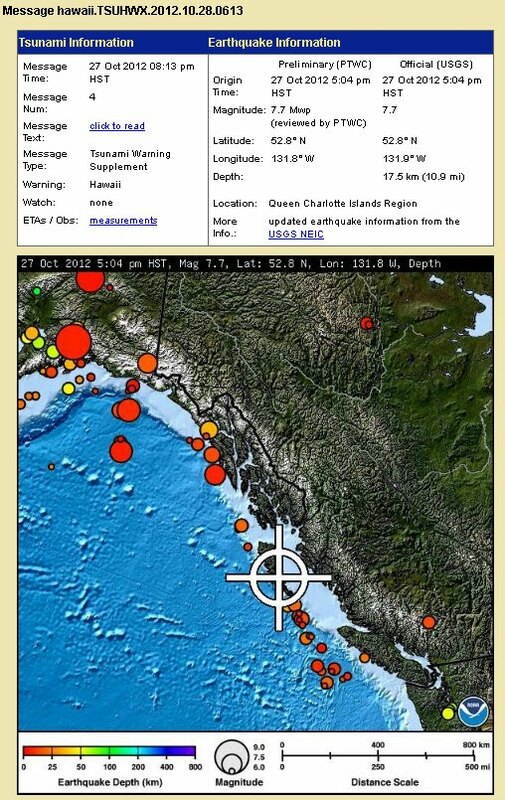 Canadians as far as Prince Rupert on mainland British Columbia felt the quake. Tanya Simonds said she felt like her house was "sliding back and forth on mud," but didn't see any damage from the tremor. Shawn Martin was at a movie theater when the quake struck. "It just felt like the seats were moving. It felt like someone was kicking your seat," he said. Martin said more than hundred cars headed toward a popular intersection in the city known for its higher ground. Fryer said he expects Hawaiians to also seek higher ground due to the expected "significant flooding." "The rest of the Pacific does not have to worry, but Hawaii does," he said.